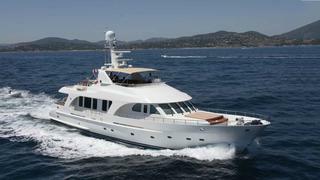 The 25.75 metre motor yacht Moon River has been sold with Jeroen van der Vliet at Van der Vliet Quality Yachts representing the buyer and seller. Built in steel and aluminium by Dutch yard Moonen to a design by Rene Van der Velden, MoonRiver was delivered in 2003 with a thorough refit in 2009. The refit saw her receive new generators, a refreshed interior, a full hull and superstructure repaint and the installation of Naiad zero speed stabilizers. Built to Lloyds class, she has an interior in silk gloss red cherry wood paneling contrasting with pure wool carpeting throughout in beige and royal blue. Accommodation is for up to nine guests in four cabins consisting of a master suite, a double and two twins with a Pullman berth, and all cabins have entertainment centres, television screens and en suite bathroom facilities. The saloon lounge area has L-shaped settee seating to port along with two armchairs and an entertainment centre including a large Sony television screen on a rise and fall mechanism plus a Bang & Olufsen surround sound music system. Stainless steel and glass doors give access to the aft deck offering a spacious dining area on a built in sofa, table and chairs. The sundeck offers more al fresco relaxation, with two tables seating up to 12 guests, a wet bar, grill and a waterproof television screen, all protected from the elements by fore and aft Bimini tops. Twin 480hp Caterpillar diesel engines give her a comfortable cruising speed of 10 knots.